Jon loves to teach. Here he fills in for an absent teacher in junior boys’ Humane Letters. I t’s 8:25 on a Wednesday morning and Jon Balsbaugh, the new president of Trinity Schools, strides into the junior boys’ Humane Letters Seminar with coffee mug in hand. (He’s filling in for a few weeks for a Greenlawn teacher on parental leave.) Fifteen young men wait for him with their marked-up copies of Plato’s Phaedo, the dialogue that contains Socrates’ case for the immortality of the soul. Six narrow tables are arranged in a hexagonal shape beneath the white fluorescent lights, but Jon doesn’t sit down alongside the students or pull out a book, choosing to stand at a green chalkboard. As the boys summarize the argument, Jon creates a visual map of its logic in a neat, all-caps hand. When the discussion shifts from one-by-one summarizing to pell-mell debating, he lets it run free, jumping in occasionally to help a quiet boy break into the verbal scrum or to pose a question. Watching the conversation unfold, I realize that his stance outside the hexagon has a purpose. The students face one another and speak to one another as equals, instead of constantly looking to their teacher for approval. They debate the question of whether the human body is a distraction to the soul’s pursuit of wisdom, as Socrates claims it is. Then a taller student gets up from the table to lower a window blind, but he tugs too hard on the cord and the blind bursts through its brackets and falls to the floor. The students burst into laughter and a little applause. “Why did you get up to lower those curtains?” Jon asks. There is more laughter and humorous banter. “Socrates’ point exactly,” a student says. 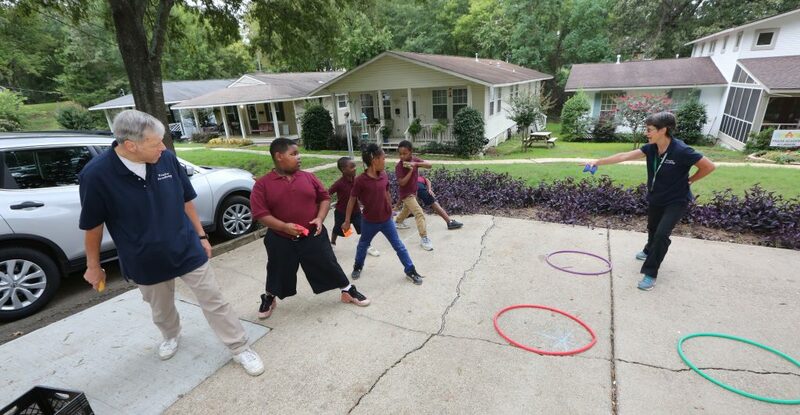 Jon began teaching at Trinity School at River Ridge in 1997, fresh from graduate school, where he had earned an M.A. in English. At the time, his wife Jen was pregnant with their first child, and the young father-to-be says he badly needed a job. A west coast native, he had never heard of Trinity Schools, but a friend showed him the list of books students read and an article about the school, and he knew he had to teach there. The jobs would create new ways for him to teach and learn. Dr. John Vogel, a retired River Ridge math teacher, knows Jon well as a colleague, fellow men’s group member, and Jon’s head for many years. He recalls how, soon after becoming head of school at River Ridge, Jon rearranged the desks in the faculty room, altering the pattern from pods of four to six desks to two long rows of desks facing each other, a new spatial geometry that allowed the faculty to see one another more clearly. He kept a desk of his own there, working there often, using his private office when he needed to meet with faculty, parents and students. He wanted the students to have this same kind of frolicking wonder, and so he announced one day that regular classes would be cancelled in favor of what he called Das Lernvergnügenfest or “Free Learning Day.” The students could spend the day pursuing their interests in special classes taught by Trinity teachers, covering everything from poetry to Italian cooking to advanced math. A new tradition was born. Jon’s wife, Jen, is cut from the same cloth. She tells me that her own love of learning flourished in a book club she participated in with other women. 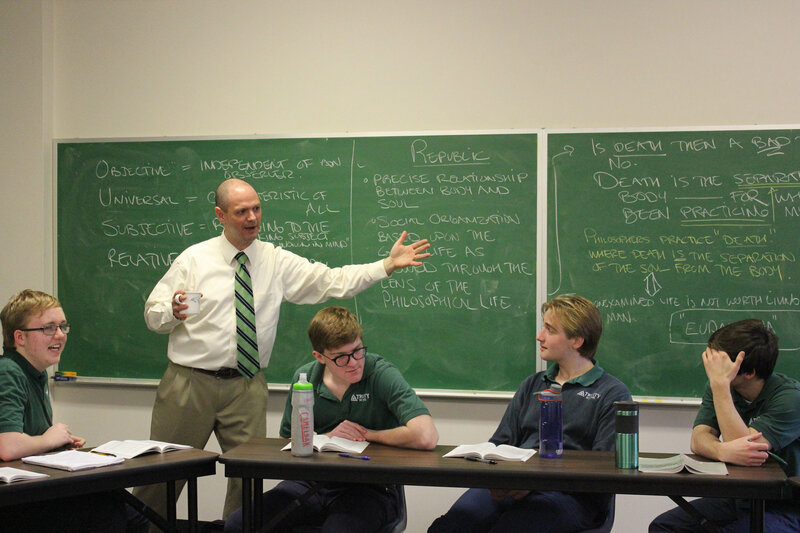 Over the course of 12 years, “We worked our way through a substantial portion of the Trinity curriculum.” The group wanted to read Milton’s Paradise Lost, but felt that to really understand the book they had to start with Homer’s Iliad and Odyssey, Virgil’s Aeneid and Dante’s Divine Comedy, which they read before finally getting to Milton. The Balsbaughs have five children including one Trinity graduate (Dietrich) and three current students (Anna, Emily, Nora), as well as a fifth child, Charis. Jen says she and Jon are united in their love and support of Trinity. During his 20 years at River Ridge, Jon’s sense of wonder and his eclectic interests (photography, poetry, Japanese aesthetics, Cambodian food, Bob Dylan, old buildings, etc.) became known to the school community, as did his personality—his willingness, like the gadfly Socrates, to incite conversation with questions and stick around for a couple of hours as the issues got sorted out. Understanding what he was getting at—the difference between “school” and real learning—requires a trip back to his childhood. Though he was a National Merit commended scholar and the valedictorian of his class, Jon didn’t want to go to college, hoping instead to ride his bicycle across the country with a friend. When the road trip plans fell through, he reluctantly applied to the Master’s College, a nondenominational Christian school in Santa Clarita, California, majoring first in youth ministry, then in English. By the end of his sophomore year he was ready to quit. He spent that summer working in a machine shop, hoping to understand more intimately the work his father had excelled at. He liked to pass his evenings with a fishing rod in one hand and a Jane Austen novel in the other. He longed for friends who shared his growing interests in literature and in theology, but he hadn’t found those kind of friends at school. He wanted to quit and asked the manager of the machine shop for a full-time job. The manager refused, telling Jon that he had never finished college himself and that he wasn’t going to be a party to Jon’s dropping out. Jon took this photo of a fire hydrant a few blocks away from Greenlawn as part of his “South Bend 365” project. I take Jon on a driving tour of the northwest side of South Bend, through a landscape of vacant lots, dilapidated houses and winter grit. It’s a part of town that many local residents avoid and have long since moved away from, myself included. Ever since he arrived in South Bend, Jon has made a habit of wandering the city and the surrounding countryside, following the roads wherever they take him. 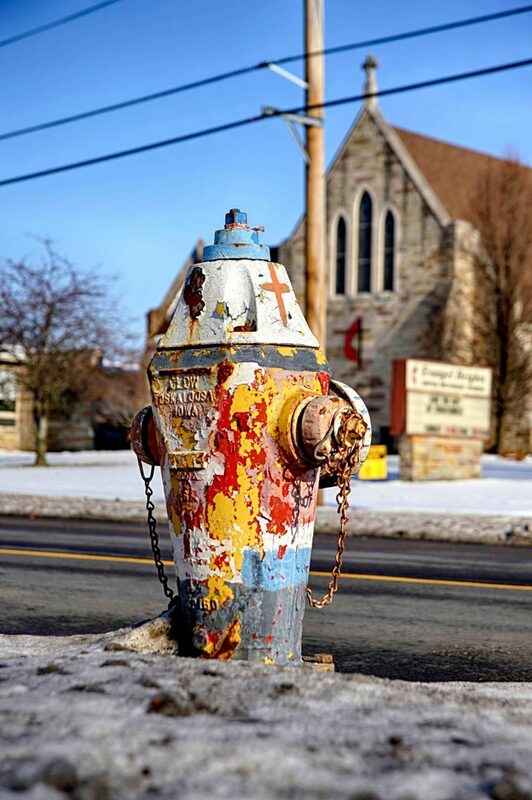 He brings his camera and takes pictures of the things he finds, not just the local landmarks but oddities that locals like me have stopped noticing: an abandoned trailer, the underside of a bridge, a man crossing a snowy street, an old cemetery or church. He set a goal for himself of posting a picture a day for a year, the first year of his new life in South Bend. He learned photography while teaching a colloquium at River Ridge, getting as much out of the course as any of the students. He began deliberately taking his camera with him, until eventually he carried it most of the time. He loved going to the Minnesota State Fair and taking pictures of the human carnival he found there. “I like the choices involved in presenting an image or looking at something,” he says. I tell him that I’ll gladly stop the car if he sees something he wants to photograph, and sure enough he notices something I hadn’t seen, a roadside memorial that consists of a shaggy pink stuffed bear strapped to a street light, surrounded by empty vodka bottles. “To me, gritty realism is not at odds with the power of beauty to move the human soul,” he said later. 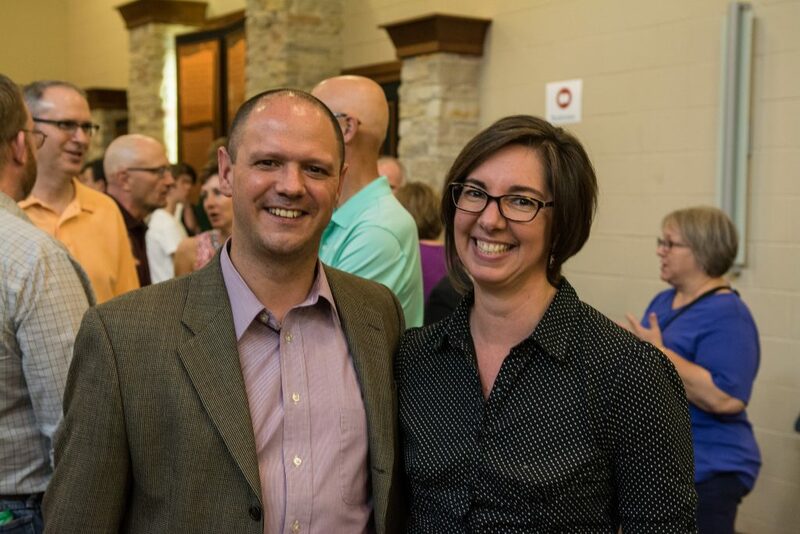 Jon and Jen Balsbaugh at a large farewell party attended by Servant Branch members, Trinity School faculty and students as well as other guests at River Ridge last June 2. Back in the Humane Letters classroom, the students are talking about Socrates’ statement that the purpose of philosophy is to practice for death. Jon decides to stop the conversation to tell them about Dr. David O’Hanley, a River Ridge faculty member and community member who died on Feb. 16. He uses his smartphone to play an audio recording of a morning prayer talk David gave to River Ridge students not long before he learned of his own cancer diagnosis. He ends the class on that note, wrapping up a few minutes before the bell rings, their learning for the day accomplished. The rhythms of “school” haven’t quite overtaken them.